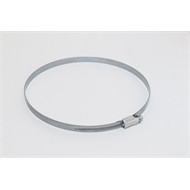 Use this clamp to secure 200mm duct to a duct connector or to a spigot on an appliance. Clamp is secured using a screw driver to tighten the worm drive mechanism. Can be used on different types of duct and also on hoses as a hose clamp.